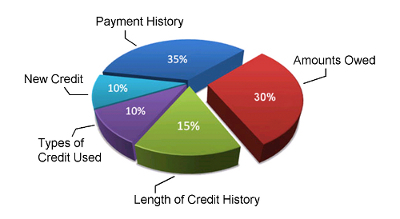 Learn about the 5 factors that are used to determine your credit score. The payment information that is reported shows separately for each account you have. It shows whether or not you’ve paid as agreed, it shows if it is a deferred payment plan or if payments aren’t currently required (like for a student loan), how many past due payments you have, how often your payments have been late, if you have any debts in collections and if you have any negative information in the public records portion of your credit report (bankruptcy, judgments, liens, etc.). If you have been involved in a bankruptcy, consumer proposal, orderly payment of debt or debt management program, your credit history will essentially restart whenever you complete your program. To get your real, actual credit score, you'll need a lender such as your bank or credit union to "pull" it and let you know what it is. Not all lenders will do this, but some will. You just need to ask. The best time to do this is when you're applying for credit or opening a bank account. When they pull your credit score, this will count as a "hard hit" on your credit report, but don't worry, it usually takes at least several enquiries like this per year to begin to slightly impact your score. To get an estimate of your credit score, you can pay either of the credit reporting companies, Equifax or TransUnion, or you can get a company such as Credit Karma to give your credit score to your for free (they pay for it but make money by getting you to agree to allow them and other companies to advertise to you). We don't endorse any of these options, we're just letting you know what they are. Your credit score with Equifax and TransUnion should be similar, but can differ a little as it's possible that some financial insitutions may report to one credit bureau and not the other. Please also be aware that the score you get from any of these place is not your actual credit score. It's only an estimate generated by a different algorithm - not the real credit score generating algorithm that banks and credit unions have access to. You can also get a free estimate of your credit score by trying this credit score estimator tool. It seems to do a fairly good job - and it's free! What's also nice about it is you can try playing with information and seeing how different scenarios can impact your score. You are entitled to have a free copy of your credit report mailed to you once a year. You can also pay for an instant copy too. Find out how both these options work. It is important to have a look at your credit report every once in a while to make sure that there are no inaccuracies and that no one has applied for credit in your name without your permission. Normally, the best things you can do to improve your credit score are to manage your money wisely using a realistic spending plan and deal with your debts. If you need help with either of these things, you can make a free appointment to speak with one of our Credit Counsellors either in person or over the phone. 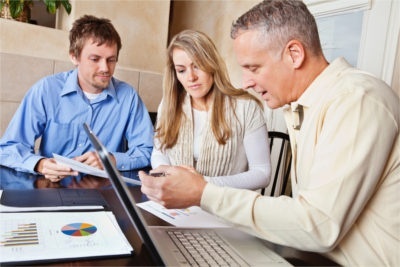 They can help you go over your situation, put together a budget, look at all your options, and then put together a plan to help you get your finances and credit back on track as soon as possible. Appointments with our Counsellors are always free, completely confidential, and non-judgmental. We’re simply here to help you. Give us a call at 1-855-232-4888.